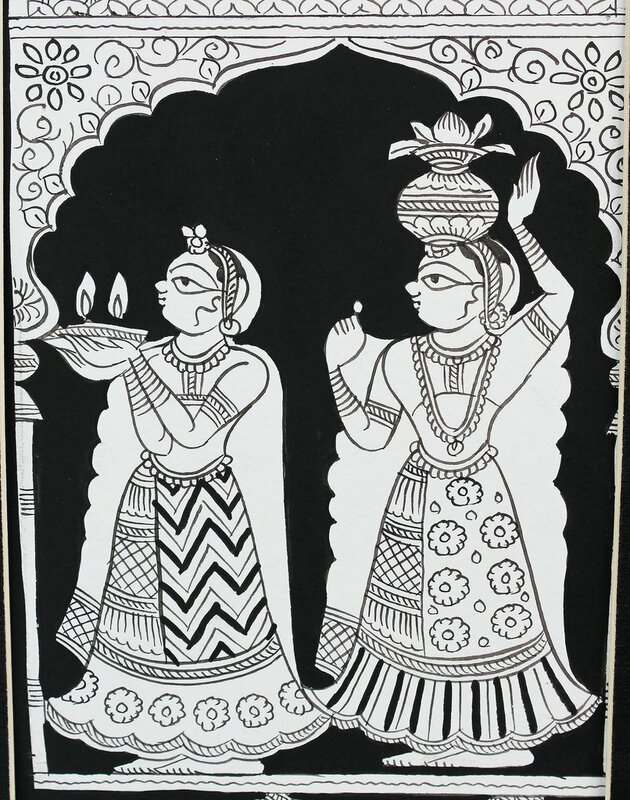 The paintings provide the backdrop against which the songs, dances and narrations are used to create an evening of magic and entertainment usually in the centre of the village. 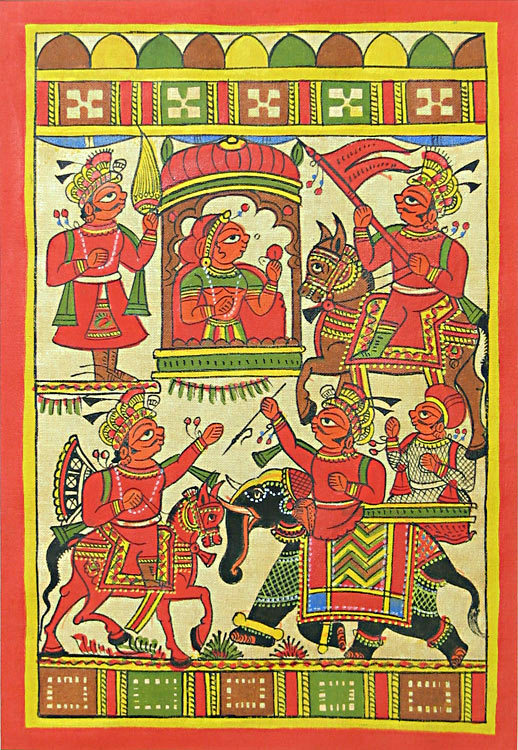 Phad paintings are made on cloth or walls and most popularly depict the story of the local hero-gods – Pabuji & Devnarayanji. Each painting depicts a different episode and they are opened or unrolled only after sundown, in conjunction with an all night performance. This is possibly why these paintings are called Phad which means folds in local dialect. All Phad paintings have certain common features. Every available inch of the canvas is crowded with figures. Another similarity is flat construction of the pictorial space. While the figures are harmoniously distributed all over the area, the scale of figure depends on the social status of the character they represent and the roles they play in the story. Another interesting feature is that the figures in the paintings always face each other instead of the viewer. These paintings in their traditional form are very wide to accommodate the numerous episodes of the complex stories. Some Phad painters are also experimenting with the ‘collage’ form for Phad paintings where while remaining true to the basic principles of the art form they combine various aspects of the art form to create a visually appealing modern painting. Phad sketches made with a single stroke of the pen while following the Phad form are also gaining popularity. The phad is painted on thick canvas that is about 30 feet long and five feet wide and is prepared by members of the Joshi clan. The colour palette consists of bright orange, red, yellow, black, blue, green and brown, derived from stones and minerals. The colours are prepared by the women artisans while the preparation of the canvas through applications of starch and kheriya gond (indigenous glue) and ghotana (burnishing) is done by men. The artist prepares a mixture of wheat/rice flour and boils it with water till it turns in a thick fine paste. This process is called “Kalaph Banana”. He then applies the paste of boiled wheat/rice flour and gum on the cloth. It is called “Kalaph lagana”. The cloth is stretched and dried well in hard sunlight. This is called”Sukhana” and then rubbed with a stone device (Mohra) to make it smooth and shining. Which is called Ghotana”. The cloth is now ready and works as well as canvas. The artist prepares his paints from gum, powdered earthen colors, water and indigo. They keep a grinding stone on which the colors are ground with gum and water. This process is called “Rang Banana”. Earthen colors are used to give the tempera effect. Indigo, a color obtained from a plant, is still used for blue. The painting begins on an auspicious day with the ritual offering of a coconut to Sarasvati (the Hindu goddess of learning and fine arts). The first stroke of brush is always made by a virgin girl belonging either to the painter’s family or to a higher caste. The painter first of all divides the entire scroll into a number of sections and sub-sections, then he prepares rough sketch of the whole painting in light yellow color. This is called “Kachi likhai Karna”. As the rough sketch is ready, the artist starts using colors in layer pattern from lighter to darker value, Orange for limbs or torso of figures, Yellow for ornaments & general clothing & designs, Green for trees & vegetation, Brown for architectural structures, Red for Royal clothing & flags and blue for water and curtains. This is called “Rang Lagana”. The subtle black lines give the final touch. The forceful linear expressions become lively after “Shyahi kadhana ( Application of Black Color) is put on the phad. Ornate borders, creepers, trees, rivers and buildings are used as scene dividers and the entire composition is enclosed within a thick border that is always painted an auspicious red. The principal form of worship entails night-long narrations of their deeds by the Bhopas, wandering priest-bards of Rajasthan. These performances are held in front of the phad, painted narrative scrolls that function as portable temples of the deity and as pictorial aids. The narration is accompanied by ravanhatta, a violin-like instrument. The phad is composed in square panels, each illustrating a particular incident of the epic; assistants standing behind the Bhopa unfold the scroll as the story proceeds and the showman points to the relevant depiction as he sings and mimes. In 10th century Chochu Bhat commissioned Joshi Phad Painter to make Phad painting on Devnarayan’s whole life. After seeing that artwork, Devnarayan privileged “Joshi” caste to make Phad paintings and since then “Joshi” are doing Phad painting.